alaTest has collected and analyzed 33 reviews of Sanyo VPC-GH4 Dual Camera Xacti Microphone. The average rating for this product is 4.0/5, compared to an average rating of 4.0/5 for other Camcorders for all reviews. Reviewers really like the zoom and size. The portability and usability also get good feedback, but there are some less positive reviews about the memory and reliability. There are some mixed reviews about the battery and image quality. We analyzed user and expert ratings, product age and more factors. Compared to other Camcorders the Sanyo VPC-GH4 Dual Camera Xacti Microphone is awarded an overall alaScore™ of 79/100 = Good quality. alaTest has collected and analyzed 29 user reviews of Sanyo VPC-GH4 Dual Camera Xacti Microphone from Amazon.com. 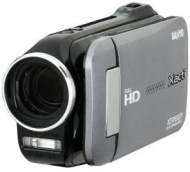 The average user rating for this product is 4.0/5, compared to an average user rating of 3.9/5 for other Camcorders on Amazon.com. Reviewers are impressed by the zoom and size. The portability and price are also mentioned favorably. Some have doubts about the memory and reliability, while there are some mixed opinions about the image quality. The Sanyo VPC-GH4 HD digital camcorder features a 10.7 megapixel CMOS optical sensor, a 34 millimeter lens with 10x dual range zoom and built-in YouTube support.